It's coming! It's coming! Hallowe'en, one of my two favourite times of year! I do enjoy all of autumn, it's much more fun creating for Hallowe'en. I've been thinking of Hallowe'en a little earlier this year, trying to get the seasonal patterns out a month early. In mind: a witch toilet tissue cover (similar to my bride, bunny, snow couple, leprechaun), some more macabre body parts (like my Dismembered Digits), and a Hallowe'en Tote. I also would like to do another Hallowe'en afghan square. I had done a square some time ago, and it was suggested I call it Spider in the Barn, even though there were 16 legs instead of 8. Of course, if you're dead scared of spiders, all those legs...very well could seem like 16! 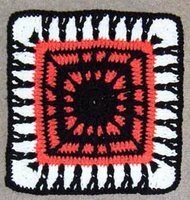 Anyway, I was looking for seasonal squares for a crochet along in one group, and decided to adapt the 6" square to make a 12" square. I've posted the pattern here (it is available, along with that year's crochet along at Needlecraftpals--but since it's a free site, and I've passed the link along to others, it very well could exceed its bandwidth. ): **thanks to the Google Help groups, I switched to firefox and was able to upload my pic! 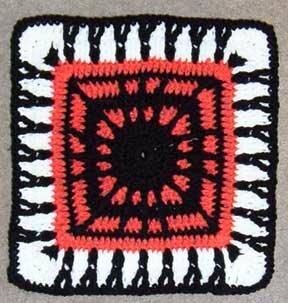 This square was designed for a ‘masculine’ afghan. My two daughters named it: even though there are more than the 8 legs spiders have, they both felt it looked like a spider. Finished Size: app. 6". Your tension may differ from mine, and you may need to use a smaller/larger hook to get the 6". Materials: Worsted weight yarn in two colours. Special Stitches:DTR=yo 3 times, insert hook in next st, draw up loop. (Yo, draw through 2 loops) 4 times. FPDTR=as above, but worked around post of specified st.
FPTR= yo twice, insert hook around post of specified st. pull up loop. (Yo, draw through 2 loops) 3 times. With Col A, ch 4, sl st in 1st ch to form ring. Rnd 3: Join B in any st. Ch1, sc in same st. (ch2, sk 1 st, sc in next) around. Ch1, sc in first st to join. Rnd 4: Ch3, dc in same space around post of sc. *2hdc in next ch2 space, 2sc in next space. 2hdc in next. (2dc, ch1, 2dc) in next space for corner. Repeat from * around, ending with 2dc, ch1 in same space as first 2dc. Join, FO B.
Rnd 5: Join A in any corner ch1 space. Ch3, dc in same sp. *dtr into unworked loop of rnd 2 (FPDTR). 2dc in same space as first 2dc. Dc in 3 sts, dtr into unworked loop of rnd 2. (Dc in 2 sts, dtr into next unworked loop of rnd 2) twice. Dc in 3 sts. 2dc in next corner space. Repeat from * around. Join, FO. Rnd 6: Join B in top of any corner dtr. Ch3 (dc, ch1, 2dc) in same st. Dc around, working (2dc, ch1, 2dc) in each corner dtr. FO. Rnd 7: Join A in blp of ch1 corner st. FPDTR around post of dtr below. Sl st in same corner st. Continue working in blps only: *sl st in 6 sts, FPTR, sk next st of rnd 6. Sl st in 3 sts, FPTR, sk 1 st, sl st in 4 sts, FPTR, sk next st, sl st in 5 sts. (Sl st, FPDTR, sl st) in corner st. Repeat from * around. Join, FO. Weave in ends. **************************************************************************************************************For a 12" square, I adapted as follows: Follow above pattern through rnd 6. Puff st= leaving last loop of each st on hook, 3dc in same st, yo, draw through all loops. Rnd 7: (replaces rnd 7 of 6" square) Join A in corner ch1 space. Ch1, * sc in corner space. [FPDTR around post of fptr below. Sc in same corner space. Sc in 6 sts, FPTR around fptr, sk 1 dc, sc in next 3, fptr around fptr, sk 1 dc, sc in 3, fptr around fptr. Sk 1 dc, sc in next 6. Repeat from * around. FO col A.
Rnd 8: Join B in any st. Dc around, working 5 dc in top of each corner fpdtr. FO. Rnd 9: Join A in any center corner st. *3dc in centre corner st, ch1. Sk 1 st, (puff st in next st, ch3, skip 3 sts) 6 times. Ch1. Repeat from * around. FO. Rnd 10: Join C in any center corner st. *5dc in corner st. Dc in next, tr in front of ch1 of rnd 9 into skipped st of rnd 8. (Dc in blp of puff st, tr in front of ch3 of rnd 9 into skipped sts of rnd 8) 6 times. Dc in blp of next puff, tr in front of ch into skipped st below. Dc in next st. Repeat from * around. Rnd 11: Dc around, working 5dc in each corner st. FO C.